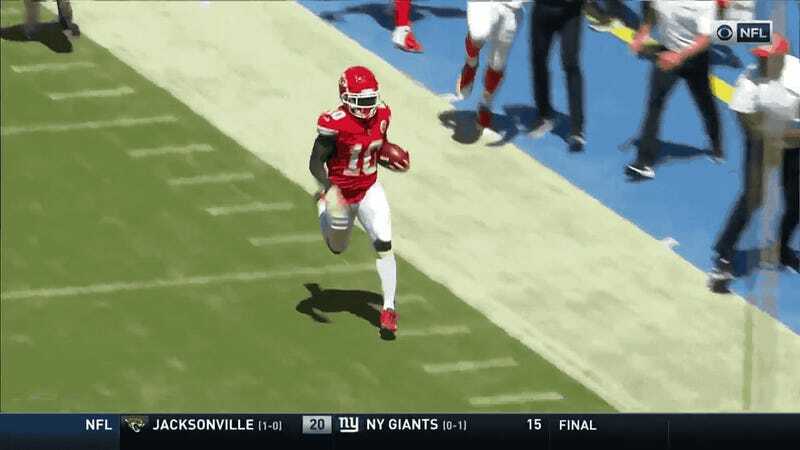 Chiefs WR/return specialist Tyreek Hill is ridiculously, blazingly fast, and he got to show off that speed almost immediately after Kansas City began their season today. When the Chiefs got a defensive stop, and the Chargers punted away, Hill took the opportunity to cross the field and then run 91 yards to the end zone while barely getting touched, throwing up a peace sign at the end of his journey. That’s a fun highlight in itself, but pair it with the end of the Chiefs’ following drive and it gets even better. With the ball in KC’s own territory, new starting QB Patrick Mahomes tossed a ball across the middle for Hill, who made one guy miss and then couldn’t be caught, doubling his TD total for the year with a 58-yard catch and score. The Chargers should really think about running faster. Update (4:50 p.m.): This is a good catch.